Blog Can Cascades Be Gardeny? 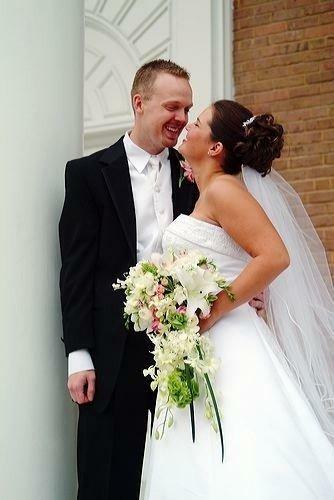 With more and more weddings drawing inspiration from vintage styles, cascade bouquets are slowly gaining in popularity. If you are looking at old photos of your Grandparents’ weddings, you may have noticed that the majority of those bouquets were the long, large, and overpowering cascades that most people have come to dislike. The wedding styles of the 80s didn’t help either, as some people see a cascade bouquet and think poofy sleeves and big hair. 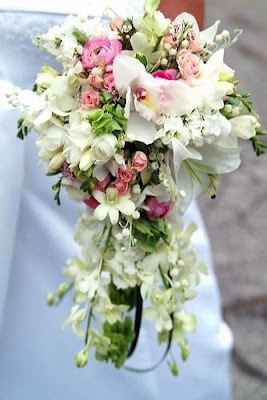 This bouquet is an example of how a cascade can still be gardeny. All the texture of a hand-tied style is included in this flowy bouquet–a cascade done in a slightly modern style. Long, green lily grass is used to add length while giving the design a little flair. The bride is not overpowered by this bouquet. It compliments her well without stealing the show. 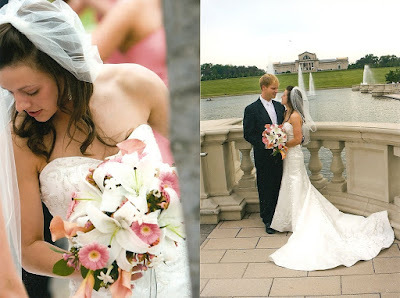 This bride wanted just a slight cascade to her bouquet. Notice that the bulk of the flowers are contained more in an oval shape with just a few flowers breaking the line to create the cascade. Again, nothing too overpowering and still very elegant. This is a tear-drop shaped bouquet. All of the flowers are tight to form a less flowing cascade shape. 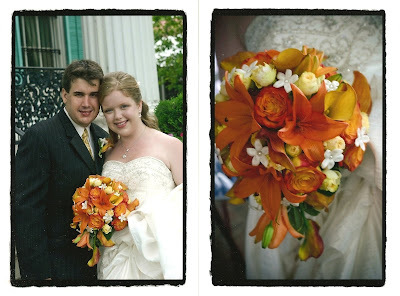 This is another option if you like the forward-facing bouquets, but don’t want too much of a cascade. Even though hand-tied bouquets seem to be the most popular, there are still many gardeny and slightly modern options available if you prefer a cascade bouquet.